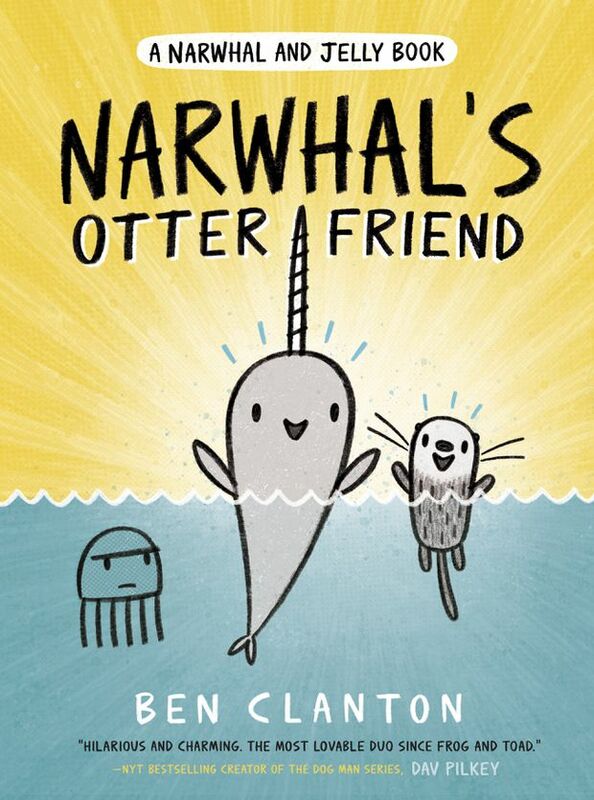 It took Ben Clanton four years to turn his Narwhal and Jelly idea into a published book, but the series is now at four books and counting. The Narwhal and Jelly publishing phenomenon started with an idea about a delightful friendship between a whale who is up for any adventure and a gelatinous sidekick who often raises his eyebrow in doubt about Narwhal’s ideas. But another dynamic duo, a human one, is the creative force that developed the Narwhal and Jelly juggernaut: a book series that has recently sold more than one million copies in print and foreign rights in 13 territories. First, meet Ben Clanton. He’s the young man seated in a café in downtown Toronto. His prodigious imagination hides beneath his rectangular, black-rimmed glasses, a tweedy jacket and a shy smile. He lays out his background like a balance sheet. An American who lives in Seattle. Go figure - he studied anthropology and politics at university. In his first year at Williamette University in Salem, Ore., he volunteered to read picture books with children at a local library. “I found myself wondering, ‘Can I do something like that?’” the father of two says with a hint of childlike wonder. Could he write those books? Turns out, he couldn’t. Not at first, anyway. He had loved to draw as a child, but had given it up when he was a young teenager. Friends reminded him of his early interest in drawing, so he took their advice and started illustrating his stories. Through his four years of college, he sent out book ideas. All were rejected. When he graduated, his wife gave him an ultimatum: You have one more year to keep trying to get published. That was when the other half of this success story made her appearance. “She asked to see mock-ups,” Clanton remembers. “There are so many things I can pinpoint about my work that’s not good,” he says. “But lack of ideas is not one of them.” Still, none of the ideas he presented to Walker at that time was quite right for Kids Can. “But she gave me the option of speaking to her directly,” he says, cracking a smile. For the next few months, he kept sending ideas to her until one finally struck a chord. “I had this idea because the 2012 [American] election was coming up,” he says. His book idea, Vote For Me, is a clever satire about politics in which an elephant and a donkey say mean and horrible things about each other on the campaign trail. It was his first book to be published – and before his wife’s one-year deadline. But all through those years of publishing other books, he had a narwhal on the brain – and in his notebooks. In 2012, he had seen the creature in a photography book by wildlife photographer Paul Nicklen. “I have to confess my experience of narwhals was limited,” Clanton says. Ideas immediately swam around in his mind. By that time, Walker had moved to Tundra Books. She wasn’t convinced about the Narwhal and Jelly book idea either, but she didn’t give up on it. “I loved the characters. They totally grabbed me. They’re so sweet and funny. Narwhals are very ‘of the moment’ now. But at the time, they were not in the collective consciousness. What I was struggling with a little bit was the format. The stories were a little slimmer. They had a shorter story arc. And I didn’t know if they would work as picture books. It took four years from the time he first conceived of the Narwhal and Jelly books for the first one to be published in 2016. There are now four in the series, Narwhal: Unicorn of the Sea, Super Narwhal and Jelly Jolt, Peanut Butter and Jelly and Narwhal’s Otter Friend. In January, Clanton was signed for six more books – two more in the original series and four board books for younger children. The success includes merchandise deals for plush toys, lunch boxes, pencil cases and backpacks, as well as a film version currently under discussion. “In my editorial relationship with Ben, I feel like I am Jelly to his Narwhal. He has all these great, superimaginative pie-in-the-sky ideas and I am kind of swimming along with my raised eyebrow, saying, ‘Really?’ But I remind myself that Narwhal is almost always right. I really do trust Ben,” Walker says. His eyes light up when he talks about Walker’s intuition about him. “Right from the onset of my career, Tara really got me. It’s incredible to have someone able to see where you are trying to go with something when it’s not fully realized.” His latest book, Narwhal’s Otter Friends, is dedicated to her. At the end of Clanton’s busy day in Toronto, Walker asked him what he’d like to do. He had never been to the city. Someone suggested the aquarium. Sure! Clanton exclaimed. Walker raised an eyebrow. Really? And then off they went, side by side, for a look at creatures of the sea. The Globe and Mail asked several children what they would like to ask Ben Clanton. 1. Can you have Narwhal meet another narwhal so they fall in love and get married and have cute narwhal kids? I’m not shore yet if Narwhal will meet another narwhal in one of the books. 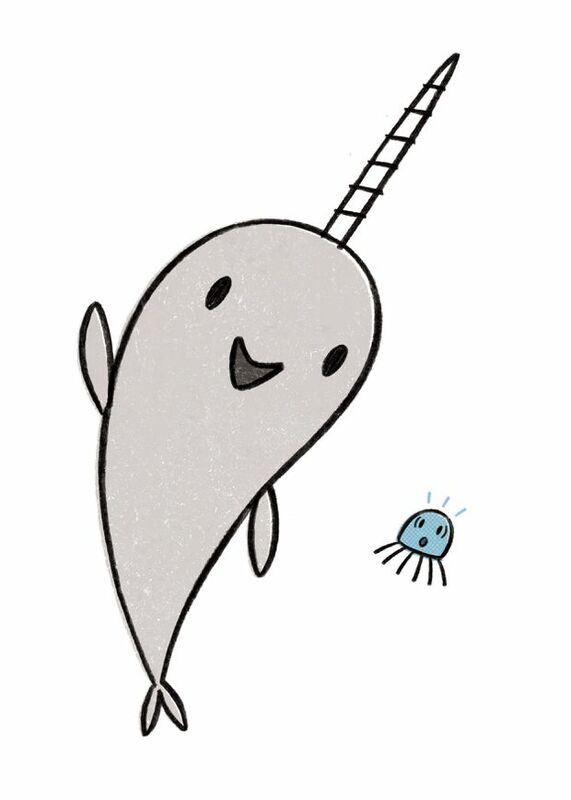 But it has occurred to me that it would be whaley fun if Narwhal met a narwhal that loves pancakes. We’ll sea! 2. Is there going to be more of Otter in the next books? Otty will certainly pop up in Otter, Narwhal and Jelly books, but may disappear for a while every now and then, as she is an explorer and always seeking new adventures. 3. Will there be more of the Octopus, Puffer Fish, Turtle and Shark in the next book? Pod-ssibly! Definitely brief appearances at the very least. 4. Will Otter ever become a super hero like in Super Narwhal and Jelly Jolt? A Super Pod I’d very much like to see happen! 5. Why are the stories so funny? Garsh! Thank you! I’m happy you think they are! I suppose it has something to do with enjoying being seal-ly and living with a Narwhal in your head. 6. What things inspire you that kids could gain inspiration from, too? Nature and the fascinating creatures in this world! Playing drawing games, too, and doodling. Carry around a sketchbook is my biggest suggestion. Inspiration can be found all sorts of places! Narwhal’s personality was inspired by ice cream and a photograph by Paul Nicklen, for instance. 7. Why did you think of Narwhal as a super hero? Narwhal lives life in a super sort of way, so I think it was only natural. Super-ness simply surrounds Narwhal! 8. Why did you make Narwhal the main character and not Jelly? Ah! Great question! While Narwhal certainly gets the most attention, Narwhal is an odd main character because Narwhal doesn’t really change much. Narwhal is pretty much excited and happy all the time. Jelly doesn’t get the limelight so much, but is really already kind of the main character. Jelly changes and grows a lot as a character. Why does Narwhal get the spotlight then? With a personality as buoyant and sparkly as Narwhal’s, it is hard for it to be otherwise. But not to worry! I think Jelly will get the star treatment in a future book. 9. Will you add more characters to your next Narwhal books? There are oodles of more characters that I have in mind for future books such as the Merry Mermicorn, Allie and Ian, Wally and Russ, Dr. Remora, and hopefully a unicorn at some point, too. 10. Would you add some land animals to the next books? 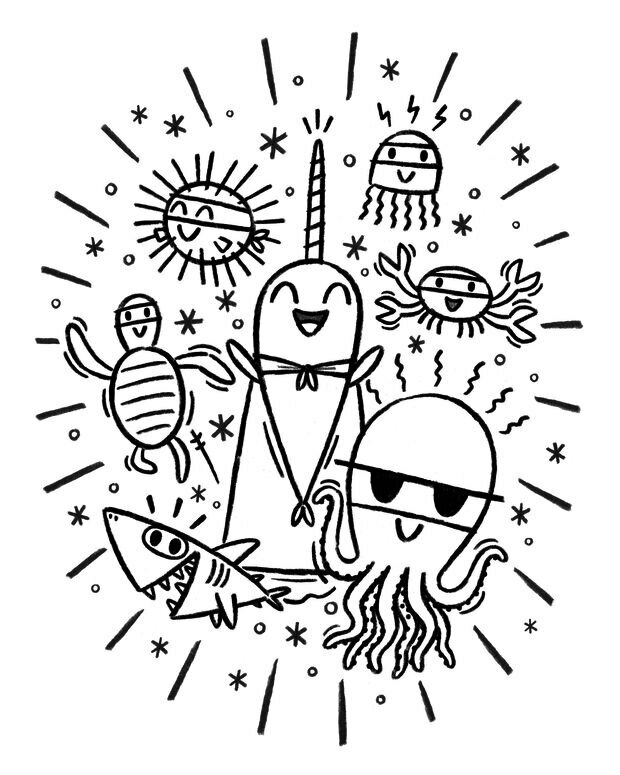 There is a Narwhal and Jelly book I have been working on that involves going on land … Not entirely sure yet! 11. Do you like the sea and do you like learning about sea-related things? My love for the ocean and the creatures in it is fathomless! Making the nonfiction sections in the Narwhal and Jelly books is one of my favourite parts. I think if I was to ever pursue another career, I’d be a marine biologist. The worlds within in the waters of this planet are a spectacular frontier filled with the most fascinating beings. 12. Do you have kids? Do they like your books? I do indeed! I have a three-year-old son and an eleven-month-old daughter. My daughter hasn’t shown much interest in my books yet. My son likes for me to pretend to be Narwhal, Jelly, and Otty, and used to enjoy having me read the books but recently has stopped asking for them because he says they are “work." Hopefully that is temporary. 13. Did you always want to be a children’s book author? It didn’t really occur to me as a kid that this was something I could do as a grown-up. And I really struggled with reading as a kid, so I think eight-year-old me would be very surprised by what thirty-year-old me is up to. I decided to start making book when I was in college. I was volunteering at an elementary school library and really enjoyed reading the picture books with students. I wondered … “Could I make something like that?” So I decided to try! And try and try and try. ‘Why did you like the Narwhal and Jelly books?’ Children respond!